We’d love your help. Let us know what’s wrong with this preview of Arkham Tales by James Ambuehl. Nestled along the Massachusetts coast, the small town of Arkham has existed for centuries. It is the source of countless rumors and legends. Those who have visited it each telling a different and remarkable account, whisper tales of Arkham. Reports of impossible occurrences, peculiar happenings and bizarre events, tales that test the sanity of the reader are to be found he Nestled along the Massachusetts coast, the small town of Arkham has existed for centuries. It is the source of countless rumors and legends. Those who have visited it each telling a different and remarkable account, whisper tales of Arkham. Reports of impossible occurrences, peculiar happenings and bizarre events, tales that test the sanity of the reader are to be found here. Magic, mysteries, monsters, mayhem, and ancient malignancies form the foundation of this unforgettable centuries' old town. 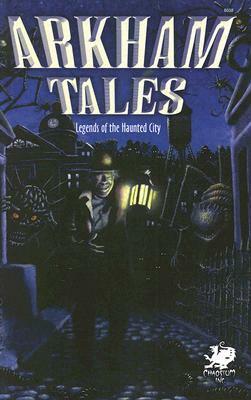 Collected in this volume are the strange and terrifying stories of the legend-haunted city. To ask other readers questions about Arkham Tales, please sign up. As I always say, when you buy an anthology of stories, you know you're getting a mixed bag. That is the case here as well; while some of these stories had me riveted, some were average, and some weren't that good. The point is, though, that this is another Call of Cthulhu Fiction book and it's worth every second it takes to read it. I liked it immensely, although to be really truthful, it wasn't as excellent as some of Chaosium's books I've read in the past. Be that as it may, it's still very wo As I always say, when you buy an anthology of stories, you know you're getting a mixed bag. That is the case here as well; while some of these stories had me riveted, some were average, and some weren't that good. The point is, though, that this is another Call of Cthulhu Fiction book and it's worth every second it takes to read it. I liked it immensely, although to be really truthful, it wasn't as excellent as some of Chaosium's books I've read in the past. Be that as it may, it's still very worthwhile looking into. I have only a minor grumble...where's the proofreader? It's disconcerting to be reading along and find a typo, misplaced punctuation or words used as adjectives that make no sense in that form. So maybe if you're reading this review prior to starting the book, you'll be on the lookout. I tend not to read reviews until after I've finished a book; at least you'll be that much ahead of me! But overall, the people that have contributed these stories are amazingly imaginative and creative so it's a very fun reading experience. I'd say it's a not-to-be-missed book if you're into C of C fiction. If you're not, and this is your first experience with C of C, then by all means read at least some of Lovecraft's original stuff before you start here. You may be lost if you don't. Mysterious Dan's Legacy*, by Matthew Baugh: a man's legacy takes him from Kansas to Arkham, Mass. in 1873, where he finds that there are people who would do anything to have it. This one actually raised hackles on my neck. Vaughn's Diary,* by Robert Vaughn: Creepy story in which a grandfather's diary leads to madness & mayhem a la HP Lovecraft. The Orb,* by Tony Campbell: A man learns from a gypsy that his son is in mortal danger, but he doesn't believe it, much to his later regret. Very well done. The Nether Collection,* by Cody Goodfellow: I LOVE this author! Harry Houdini finds himself on an unwanted tour of Arkham -- from below. What a good story! They Thrive in Darkness*, by Ron Shiflet: Well, this one I can't really say anything without giving it away, sorry! What Sorrows May Come, by Lee Clark Zumpe: A man barely holding on after the death of his wife has a brush with evil. This one was good. Arkham Pets, by James Ambuehl: A kind of silly story but placed exactly in the right spot to relieve suspense tension! Small Ghost, by Michael Minnis: Some strange goings on at 625 Parsonage Street are said by its owner to be the work of a rat called Brown Jenkin. An inspector goes out to debunk this theory. Hmmm. Burnt Tea*, by Michael Dziesinski: I really enjoyed this one, the story of a strange Japanese tea ceremony at Miskatonic University. You just know it's not going to be normal if you're at Miskatonic. Very well written and a pleasure to read. I must see if I can find more by this author. Arkham Rain*, by John Goodrich: Very well done story in which the protagonist discovers some unsettling news which takes him to Innsmouth. I really enjoyed this one -- a new take on the Innsmouth legends. Regrowth*, by David Conyers: Another author worth watching for; a PI takes on the case of some bizarre plants which alters his life forever. A very cool story, one of my favorites. The Idea of Fear*, by CJ Henderson: Very different type of story than he generally writes (and I LOVE CJ Henderson's work); this time a security team tries to snuff out any supernatural elements in a house before the new owners move in. Disconnected, by Brian M. Sammons: Things start to go wrong when a detective takes on the case of a missing relative. Different, and Sammons has a cool approach to this story. The Lady in the Grove,* by Scott Lette. A fine story in which (of course), things are not as they seem, done in the form of a confession to a priest. Quite good. On Leave in Arkham, by Bill Bilstad: You'd think by now people would realize that it's not smart to fool around with the Necronomicon. But this veteran has a one-track mind. Okay. Geometry of the Soul*, by Jason Andrew: I really liked this story, in which a Pinkerton detective visits a sanitarium to get to the truth behind a series of grisly deaths. Very well done. If you count the asterisks, there are quite a few good ones in this collection. Overall, a good read & another fine addition to my library shelf. I was a little hesitant when I started reading this as I have never read any Cthulhu-related anthologies before (except for Lovecraft's stories). I have to say I was very impressed with this book. The book contains a number of short-stories which take place in Arkham, MA and are inspired by the Call of Cthulhu RPG. While some of the stories are a miss IMO, the majority of the book contains a number of excellent stories by incredibly talented authors. This book did not take me very long to read an I was a little hesitant when I started reading this as I have never read any Cthulhu-related anthologies before (except for Lovecraft's stories). I have to say I was very impressed with this book. Arkham Tales is perhaps the beginning of a new venture for Chaosium, all original fiction set in the world of their Role Playing Game, Call of Cthulhu. Back in the day, before the internet, I was unaware of the small and (semi) thriving of small press mythos magazines. The only access to modern Lovecraftian fiction I knew about was through the Cycle books, trade paperbacks by Chaosium. The most recent example of these was The Tsathoggia Cycle. Generally, these books featured reprinted stories gl Arkham Tales is perhaps the beginning of a new venture for Chaosium, all original fiction set in the world of their Role Playing Game, Call of Cthulhu. Back in the day, before the internet, I was unaware of the small and (semi) thriving of small press mythos magazines. The only access to modern Lovecraftian fiction I knew about was through the Cycle books, trade paperbacks by Chaosium. The most recent example of these was The Tsathoggia Cycle. Generally, these books featured reprinted stories gleaned and selected, usually by Robert Price, from these various magazines (Cthulhu Codex, Crypt of Cthulhu, Midnight Shambler etc). These were a definite mixed bag, with the books often containing a few winners, much mediocrity and a fair number of dogs. Alas, this was all that was available, except for an occasional fine quality hardback like Cthulhu 2000 (and even that had reprints). Lately, with improved online connections and facilitation of book production by small presses the amount of books containing almost all new published mythos fiction has sky rocketed. Also, maybe it's only my imagination but this new generation of authors (not that the last one has moved off the scene) (maybe the 4th or 5th Lovecraft Circle?) is immensely talented so most of these collections have highly superior fiction. I always say we are in a golden age of mythos fiction, and point to books like Dead But Dreaming, Hardboiled Cthulhu, Horrors Beyond and the Delta Green books. And there is so much more in the pipeline, it is almost an embarrassment of riches. GW Thomas is set to release Cthulhu Express soon, and Rainfall Books has some titles in the offing, while Pagan Publishing has a new trade paperback collection of DG chapbooks planned. Elder Signs Press has stayed very, very busy, while Kevin O' Brien and Lindisfarne Press are getting back on their feet. Edward Lipsett has opened our eyes to Japanese mythos fiction via Kurodahan Press, John Pelan plans to issue The Cthulhian Singularity and Charlie Stross' The Jennifer Morgue is coming from Golden Gryphon. This is the golden age! Even so, we must admit our debt to Chaosium and Robert Price for keeping the eldritch fires burning. And we also owe a debt to Chaosium for their role playing game, Call of Cthulhu. Actually I never played it; back when I had time for such leisure pursuits I was a D&D fan (but you gotta love a game where no matter how good you are, you eventually go insane or get eaten...). So here is my bias for the review: I do not know the source materials other than the stories by HPL and his legion of followers. And here is my assessment: you do not need to know their source material! Just like you don't need to know any of the Delta Green sources to really enjoy their books. Frankly, it's a wonder it took so long for Chaosium to elicit fiction based on their game world. After all there are tons of D&D based books. Delta Green, a version of CoC set in the modern era rife with secret government agencies and conspiracies, has been generating GREAT fiction for years now. Maybe the idea was germinating for a while but Chaosium was too broke to act on it, I dunno. Although set in or about Arkham, authors had free rein about all other content and setting, so there is no sense of repetition at all. Someone will have to fill me in on the authors' reimbursement but I think it was peanuts plus 2 copies of the book, so truly these stories are labors of love. What I really like is there was a solicitation of stories and a culling process by the highly respected William Jones, from Elder Signs Press. This means the stories are notches above the cycle books. The book itself is a good quality trade paperback, like all the cycle books. Page count is 288, not counting the editor's note, so very generous! The editor's note by William Jones is quite useful and details the setting for the anthology in Chaosium's world. Unfortunately there are no bios on the authors. Cover art is by Steven Gilberts. It shows a grizzled one eyed grounds keeper at Miskatonic University, shadowed by various critters. I am not sure about this, but I believe Mr. Gilberts did the artwork for some CoC game scenarios, so this is a very appropriate choice. This brings me to the biggest flaw in the book: there were at least a half dozen careless typos, mostly word substitutions. I did not jot them down as I was reading but, for example, p160 "fowl odors" (unless everything was supposed to smell like chickens). I think someone relied too much on a spell checker. Also in the story Burnt Tea by Michael Dziesinski busted was used as a descriptive adjective, "busted body." OK, I'll accept that a woman has a bust, or a narc conducts a bust, or you sculpt a bust. I'll buy that if you are writing colloquially in dialogue, or representing someone's thoughts, to say something was busted is appropriate slang, but in narrative detached from thoughts or dialogue it reads like the mistake of an ignoramus. Why not "broken body?" I saw this same mistaken usage twice in another story somewhere recently, maybe a chapbook, and I was equally put off by it. I won't say it killed the story, but goodness gracious it peeved me. I greatly enjoyed Eats, Shoots, & Leaves by Lynne Truss, so consider this my panda paw print. Mysterious Dan's Legacy - Matthew Baugh - This is a new author to me. In 1873 a Kansas cowboy (that was frontier territory right after the Civil War) comes to Arkham to collect an inheritance, which brings unwelcome knowledge, responsibilities and enemies. This was a very likable story; I wonder if the protagonist, Daniel Hawkins, will become a regular character in Mr. Baugh's stories. Vaughn's Diary - Robert Vaughn - Here is one story where my knowledge of the source material wasn't up to scratch and I couldn't remember if there was an antecedent story but HPL or someone else, so I don't recognize the name Timothy Erasmus Vaughn. Regarding this tale, never ever read the diary of a deceased relative who was an occultist in Arkham. Never! I hadn't read anything by Mr. Vaughn before, but this was a good read and I hope he is writing more mythos fiction. The Orb - Tony Campbell - Tony Campbell wrote After the War which appeared in Horrors Beyond. I liked that story well enough but it didn't knock my socks off. That impression is confirmed in The Orb, which is also OK but doesn't stand up to the best in this anthology. A Miskatonic Unversity librarian's father has to match wits with the Hounds of Tindalos and Nyalathotep. The Nether Collection - Cody Goodfellow - After the absorbing Cahokia in Horrors Beyond and the unreasonably entertaining To Skin a Dead Man in Hardboiled Cthulhu, and his sensational novels Radiant Dawn and Ravenous Dusk, Mr. Goodfellow can basically do no wrong. This was a change of pace, being a story of Harry Houdini and Lovecraftian ghouls. What can I say, I really liked it. Worms - Pat Harrigan - This was a fascinating story by an author I never encountered before. It chronicles the rise of a man from office drone to fanatical rabble rouser, with terrific Lovecraftian touches scattered throughout. I loved that more subtle touches were used as opposed to the usual rub your face in the fact that there's a mythos out there. They Thrive in Darkness - Ron Shiflet - With Unfinished Business in Hardboiled Cthulhu Mr. Shiflet now has two tales of Pickman and his ghouls in print. While I enjoyed the story, I confess to liking Unfinished Business better. What Sorrows May Come - Lee Clark Zumpe - Mr. Zumpe wrote The Breach, a terrific story in Horrors Beyond, and has a few stories in mythos magazines. This effort was OK, sort of a reanimation tale with a protective ghost thrown in. I liked the prose but the story left me flat; I didn't dislike it, there was just better stuff here. Arkham Pets - James Ambuehl - This very brief story by the ubiquitous Mr. Ambuehl concerned a boy who finds some crawly things in an Arkham swamp and decides to bring them home. Complications ensue. I found this amusing and diverting. Small Ghost - Michael Minnis - Mr. Minnis is very productive. Recently we've had A Little Color in Your Cheeks in Horrors Beyond (mostly good) The Prodigies of Monkfield Cabot in Eldritch Blue (OK), Salt Air (superb) in Dead But Dreaming and The Butcher of Vyones (great) Lost Worlds of Space and Time #1. Small Ghost was terrific, maybe the highlight of Arkham Tales. It was about Brown Jenkin, the rat-like witch's familiar and someone with the health department. Burnt Tea - Michael Dziesinski- I already mentioned my problem with the typos. Otherwise this was a very nifty work by an author I never encountered before, about the Hounds of Tindalos and Japanese tea ceremonies in the 1920s. Arkham Rain - John Goodrich - Mr. Goodrich is active on the mythos scene but I don't recall seeing his work before. I'll have to remedy that! Arkham Rain was a terrific story about the Innsmouth taint visiting an unwitting family. An old mythos trope? You bet! But this was a wonderfully original take. Regrowth - David Conyers - I'm a big David Conyers fan. He is becoming well published in almost all the newer mythos anthologies. This story has some thematic similarity to False Containment in Horrors Beyond, and deals with unnatural melding of disparate species. Being a Conyers yarn it was a darn good read, although I've liked other stories by him better. The Idea of Fear - CJ Henderson - We, of course, did need a hard boiled PI story in this book! Who better to do it than the masterful CJ Henderson? But this story was refreshingly different; the ending will catch you by surprise, as a PI and a medium try to find a ghost. Disconnected - Brian Sammons - Mr. Sammons can also do no wrong, especially after One Way Conversation in Horrors Beyond. This is another winner. It is about the Mi-Go and Yuggoth, and a PI tracking down a missing relative. But like everything else by Brian Sammons, do not expect the usual mythos conventions or story format. The Lady in the Grove - Scott Lette - Yet another new author to me and yet another auspicious introduction! An Irish enforcer is sent to Arkham to provide a little muscle for an MU professor. On Leave in Arkham - Bill Bilstad - Ditto the above. This story has a complex construction with rapidly switching time frames and viewpoints, about WWI veteran/murderer. Very worthwhile read. Geometry of the Soul - Jason Andrew - Also a new author to me, Mr. Andrew's story was only OK, about a MU expedition that goes horribly awry. The initial few pages in the Arkham sanitarium were much better for me than the last few pages. A fun bunch of Lovecraft pastiche. Nice collection. As always, some brilliant, a few stinkers. But on the whole one of the better collections.